Riding DCTA buses seems like a normal routine. You arrive at your stop, get on the bus, enjoy the ride and get off at your desired location. But have you ever thought about the process it takes for us to get our buses on the road every day so that our passengers such as yourself can get to and from their desired destination? 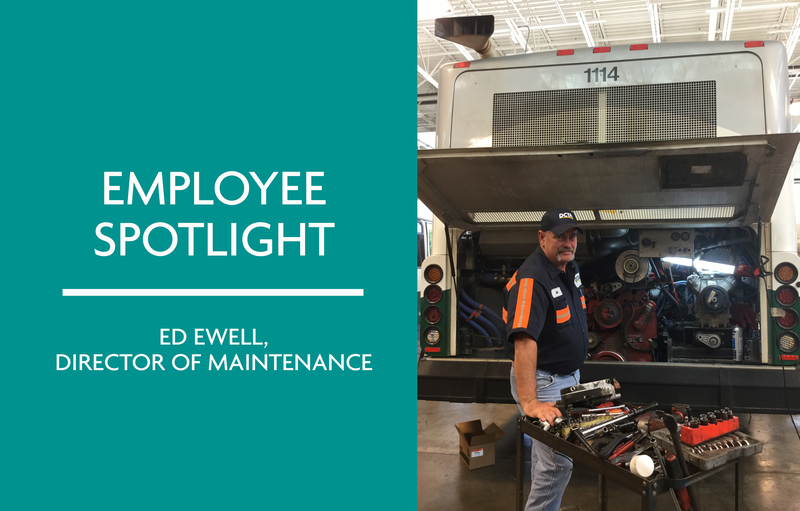 Let us introduce you to the man behind-the-scenes who makes this happen smoothly – Ed Ewell, Director of Maintenance. He has worked for DCTA for nearly 12 years. Ed started out working for LINK, the mass transit service operated by the City of Denton since 2002, before it was absorbed by DCTA. He worked his way up from a bus operator to a bus supervisor for DCTA’s Commuter Express Bus service all the way to his current position today. The most important aspects of the job according to Ed is making sure DCTA has enough buses for operation and ensuring that all DCTA buses are working properly and are clean for bus operators to drive. In addition, Ed works hard to stay on top of the latest bus technology trends so that DCTA can provide the best service to our passengers. Ed was born in Ft. Bragg, North Carolina and grew up as an army brat. He started school in Paris, France and graduated high school in Germany – talk about worldwide living! Ed also served in the army for three years. In his spare time, you can find Ed taking beautiful photos for his photography business and raising desert sheep. Yes – you read that right. There is such a thing as desert sheep. You can check out some of Ed’s photography work here: https://www.facebook.com/Ewell-Photography-151104628640/.